After months of planning, after weeks of mounting anticipation, of monitoring weather patterns, running samples, jostling pick dates back and forth, and just generally getting antsy – we have FRUIT. Okay, we are still monitoring weather patterns, running samples, jostling pick dates, and staying antsy, because it’s a grape’s world and we’re just living in it. In the vineyards we source from, as for most of the region, the vast majority of the fruit is still on the vine, ticking up in sugar daily and taking its final shape. Different varietals ripen on their own schedules, under the governing influence of microclimates – in the most general terms, the warmer vineyards are ripening faster and the cooler vineyards are a little behind. After pushing it off twice due to cool weather, Tyler made the call last week at three vineyards, all Pinot Noir. 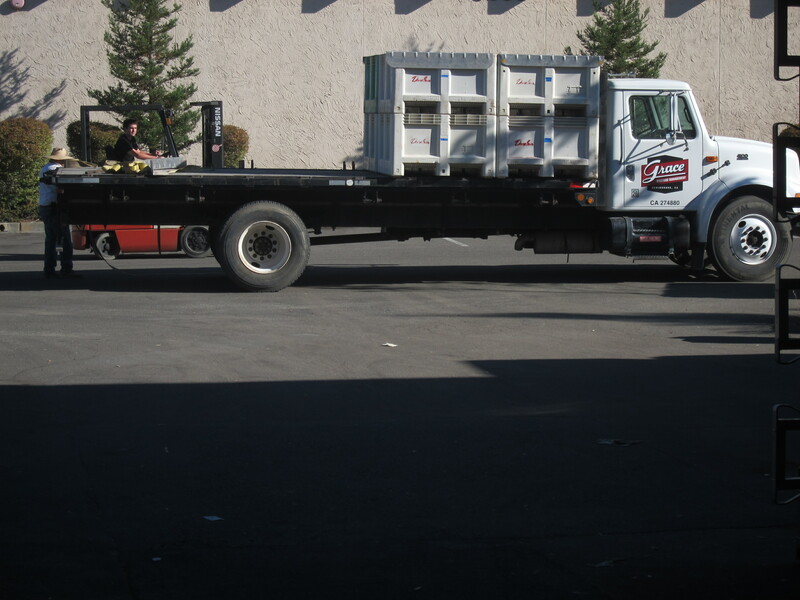 Once Tyler had settled on the whole cluster bins, the moment I had been cracking jokes about for months finally arrived. He told me . . . to get . . . IN THE BIN. I’ve been burning with curiosity about this process for weeks. So there I was. About to get in the bin. And finally able to ask: “what does stomping … um, involve?” And then Tyler spoke words I had never heard together before. So I sprayed my feet with vodka. And got in the bin. Joe said, “what do you want to dance to?” I asked for his best stomping music, he plugged in the sound system, and I stomped until all the clusters were broken up and I was half-swimming in juice. “Get your toes in there,” Joe instructed, “raptor-style.” So I did. 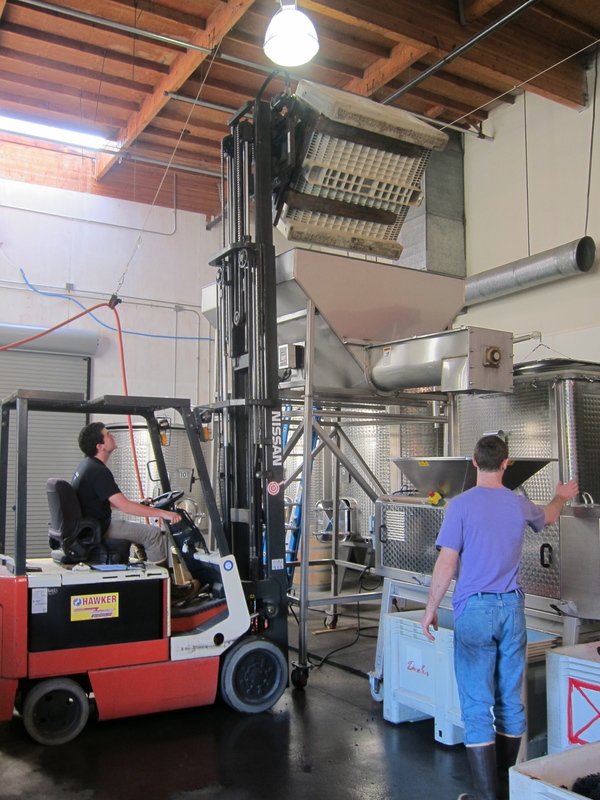 While I stomped, Joe and John dumped bins of fruit into the hopper, which sprinkles it into the crusher-destemmer by way of an augur. 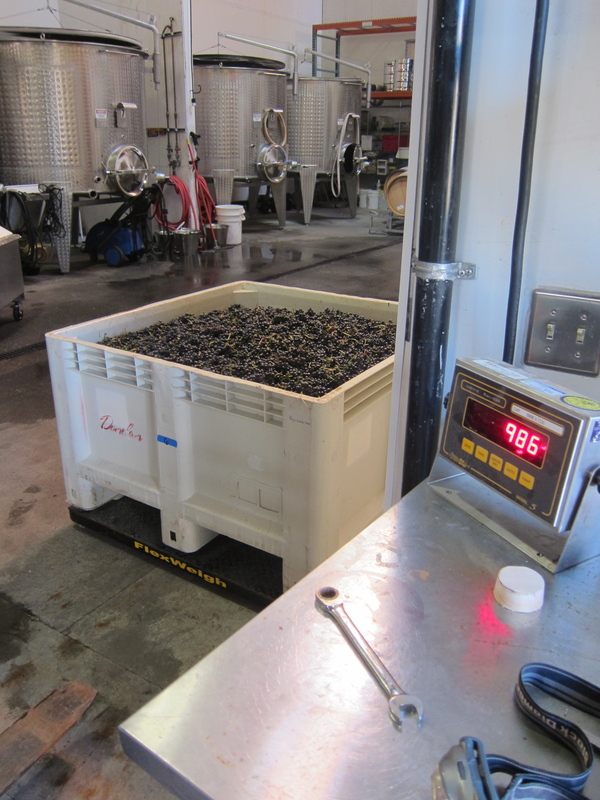 The crusher-destemmer pulls the berries from its stems and we consolidate the destemmed berries into tanks, where they will remain until they are done fermenting. 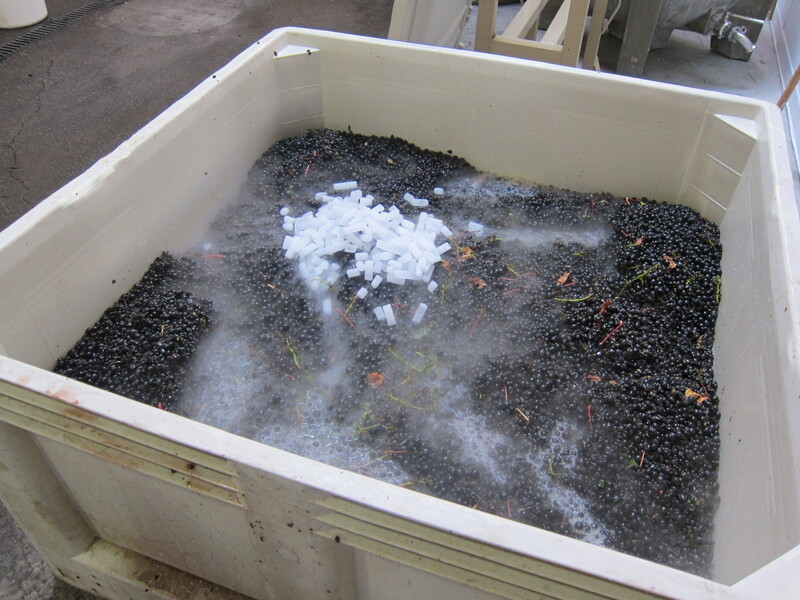 Then we throw some dry ice on them, which creates a gaseous cap on the fruit that keeps the carbon dioxide in and gets the primary fermentation going. I’ll say more about fermentations once ours have moved along some and I have photos and, um, any clue what I’m talking about. 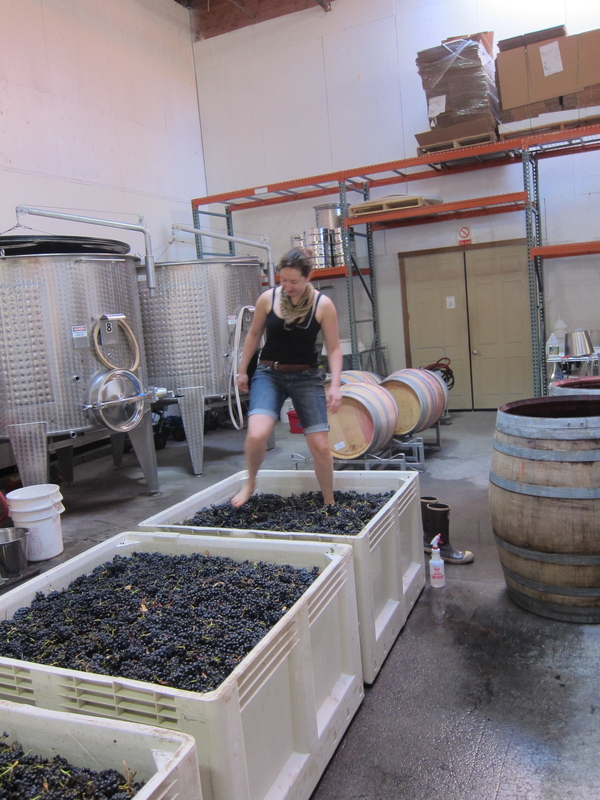 We are just getting our toes wet in the 2011 harvest – literally and figuratively. As the days get shorter, our hours are getting longer. I am beginning to see how the fatigue will add up and create a crazy energy. Now when I gather with my friends, we are all starving and exhausted and dirty, eager to put our feet up and fall sleep but still running on adrenaline. The learning goes on, and on and on. The cellar is full and crowded and sweaty; things are heavy, sharp, and hot; there seem to be infinite opportunities to do damage to myself, others, and the fruit. But the idea is to keep the mood as mellow as possible. Despite prevailing industry habits and the romance of chaos, a chaotic winery is not a healthy winery; it’s bad for the people, the cellar, and the wine. And so we’re trying to work like a well-oiled machine. Luckily the four of us make a good team. In preparation for these long days and nights, we’ve brewed our own beer, stocked up on snacks and things to grill for the many lunches and dinners we’ll be spending together. Our spirits are high, our senses of humor armed and ready. We are still bright-eyed and bushy-tailed (especially me). And I keep expecting to change my tune, but so far I can’t seem to: it’s Week 1 of harvest and I am 100% digging it. Pretty soon I’m going to be doing some actual digging.